Easter Bunny or Guinea pig spy? MAKE MINE CHOCOLATE! This Easter: buy CHOCOLATE, not live animals. Animals are no toys and will need care for the next 12 years or so. Rabbits live long. They are wonderful companions but they are no different than cats and dogs: they need freedom, love, good care, vet visits etc. Know what you are going into if you want to but an animal. If you finally think this is what you wish, buy at a RESCUE CENTER. Thousands of animals are waiting for a family like yours! 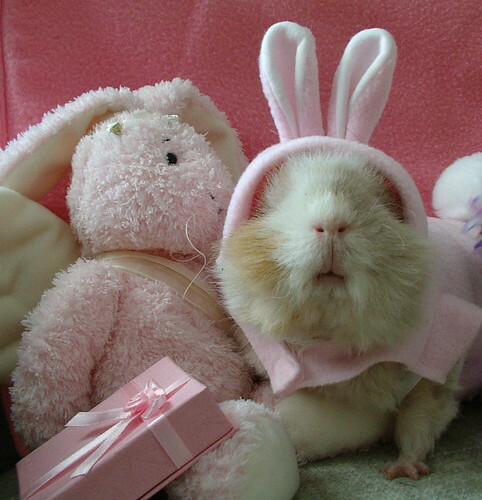 2 Responses for "Easter Bunny or Guinea pig spy? MAKE MINE CHOCOLATE!" Oh my goodness–what a cute sweet picture!!! I’ll take chocolate and leave the live animals for you since you are so good at taking care of them. Love this picture!! which is probably already overcrowded with abandoned bunnies and others animals. And I am very thankful for people who volunteer to help, give their time to save, protect, help animals in need. The world is a better place because of them!